Esther Vergeer’s journey to stardom is bound to inspire any budding sportsman and women. 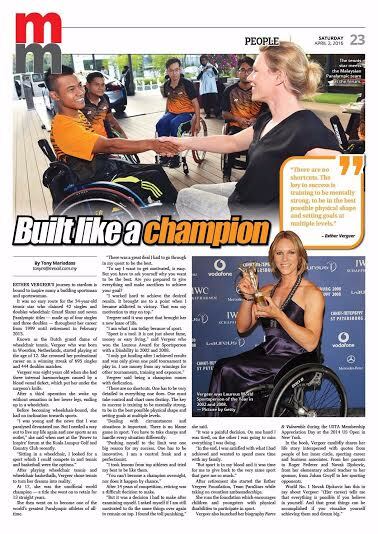 It was no easy path for the 34-year professional athlete who claimed 42 singles and doubles wheelchair Grand Slams and seven Paralympic titles - made up of four singles and three doubles titles - throughout her career from 1999 until her retirement in February 2013. Known as the Dutch grand dame of wheelchair tennis, Vergeer was born in Woerden, Netherlands, started playing tennis at the age of 12. She crowned her professional career on a winning streak of 695 singles and 444 doubles matches! Vergeet was eight-years-old when she had three internal haemorrhages caused by a blood vessel defect which put her under the surgeon’s knife. After the third operation she woke up without sensation in her lower legs and ended up in a wheelchair. Wheelchair-bound, she was no way inclined to sports until she became paralysed. “I was young and news that I am paralysed devastated me. But I need a way out to be living my life again and saw sports as an outlet,” said Esther when met at the ‘Power to inspire’ forum at the Kuala Lumpur Golf and Country Club last Sunday. After playing wheelchair tennis and wheelchair basketballs, Esther chose tennis and turned her dreams into action. At 17, she was unofficial world champion - a title she went on to retain 13 times in a row. She then went on to become one of the world’s greatest Paralympic athletes of all-time. “There is a great deal I went through to achieve my dreams of being the best. “To say I want to get motivated, is easy. But one has to ask oneself why you want to be the best. Are you prepared to give everything and make sacrifices to achieve your goal? Esther said it was sport that has given her a new lease of life. “I am what I today because of sports. “Sports is a tool. It is not just about fame, money or easy life,” said Esther who win the Laureus Award for Sportsperson with a disability of the year in 2002 and 2008. Esther said to be champion, it takes total dedication. “There are no shortcuts. One has to be very detailed and everything one does. One must take control and chart ones destiny. Key to success is training, mentally be strong, physically in the best shape possible and setting goals at multiple levels. “Dealing with circumstances and situation is utterly important. There is no blame game in sport. You have to take charge and handle each situation differently. There is no excuse for failure. You have to have solutions. One cannot blame the weather or match official for ones defeat. If you have failed it is only because of yourself. “Pushing myself to the limits was one of the reasons for my success story. One has to be innovative. I am control freak and a perfectionist. “I took lessons from many top athletes and tried my best to be like them. When Esther retired, she said it was a difficult decision. “But it was a decision I had to make after examining myself. I asked myself if I am still motivated to do the same thing and remain in top. I found that the toll was taking me,” said Esther. “It was a difficult decision. On one hand I was tired, on the other I was going to miss everything I was doing. “But in the end I was satisfied with what I had achieved and wanted to spend more time with my family. After retirement she started the Esther Vergeer Foundation, Team ParaStars and took on countless ambassadorships. She runs the Esther Vergeer Foundation which encourages children and youngsters with physical disabilities to participate in sports. Esther launched her biography ‘Fierce & Vulnerable’ during the USTA Membership Appreciation Day, at the 2014 US Open in New York. In the book Esther candidly shares her life story interspersed with quotes from people of her inner circle, sporting career and business associates. From her parents to Roger Federer and Novak Djokovic, from her elementary school teacher to her sponsor, from Johan Cruyff to her opponents in sport. World number one tennis player Novak Djokovic said this about Esther: “The career of Esther tells me that everything is possible if you truly believe. And that great things can be accomplished if you visualise yourself achieving them and dream big. Esther’s career could not have been better summed up.